An updated resource from the ACSM American Fitness Index is now available for communities not included in the current rankings. 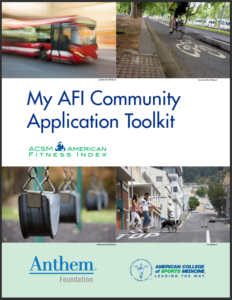 The My Community Application Toolkit enables communities to apply the Fitness Index approach to assess the community’s fitness and build understanding of the individual and societal behaviors related to physical activity in their community. Search for personal health indicators. Consider the option of a mini Fitness Index process. Assess the community’s relative areas of excellence and improvement priority areas. Use the community’s Fitness Index profile to advocate for improved fitness. The new version also features updated data sources and writable PDFs assisting in the categorization of areas of excellence and improvement priority areas. Following the completion of the My Community Application Toolkit, individuals will be able to identify where the greatest opportunities are to apply health improvement efforts in their community.